Very proud to have my work featured on the Newham Writers Workshop – published authors page. I was a member of the group in the early days of my writing career, when I was just working out what kind of a writer I wanted to be. It was an inspirational experience and one that I could highly recommend to any writer who is looking for a like-minded group of people to hang out with. I would also say that getting feedback on your writing progress is fundamental to the journey – wherever your writing goals may take you and is essential to the creative process. As a writer, you are often blind to failings in your own work that others with a more impartial view are able to see.This is how we improve our work. If someone tells you that something is wrong, they are probably right. If they try to tell you how to fix it, they are probably wrong. Try to forget feedback at least for a couple of days. If you can’t forget it, then there is probably something in it. If you can’t remember the feedback, it probably wasn’t useful. I’ve been a member of a few different groups over the years, always seeking out the opinion and expertise of others and sometimes, it is good just to know that other people face similar challenges and setbacks along the way. These days, due to work commitments, I mostly hang out online – the British Science Fiction Association has some very good online groups, as well as regular face-to-face meet ups. I also used to spend quite a bit of time with the wonderful folks at the Litopia Writers’ Colony, which I can heartily recommend. But Newham Writers was my first experience of giving and receiving feedback in a workshop environment. So I am especially delighted to have my books listed on their website. Allan Lanner has just turned sixteen and is about to find out a truth about his history and his parentage that will rock his very existence. Tasked with delivering a sword to a beautiful Countess, Allan encounters a number of challenges, which lead him from being held captive by brigands, to being rescued by a troop of southern chevaliers, then finally finding his way to Castle Helmstedt and an audience with the King. Last Friday, I attended a fascinating workshop facilitated by Caitriona Fitzsimons, the creative practitioner behind One Fine Morning. The workshop was designed to explore creativity through techniques traditionally used to teach drama that have been adapted for writing. The technique used is called ‘given circumstances’, which is particularly useful for character-driven stories, as it has been adapted from the Russian theatre practitioner, Konstantin Stanislavski, who is well known for his unique system of training actors, often referred to an ‘method acting’. Stanislavski believed that in order to convincingly portray a character, an actor should prepare by immersing themselves in the situation of the person, fictional or otherwise. As a fiction writer, it is also necessary to profile your characters and their circumstances in order to be able to walk in their shoes. During the process of writing, you become the character, and as such your descriptions are richer and more convincing. The Story Development Workshop enabled its participants to map the process of character development across a story arc from beginning to end, using global themes, thematic statements and ‘given circumstances’ for the characters in the story. It was an immersive process which involved collaboration and interaction between participants that resulted in an agreed final story, told by the participants to each other as a group. If you are struggling with an idea and are not sure how to structure or develop your story, this workshop will give you some practical tools in order to move your creative thinking forward. I particularly liked the interactive nature of the session, as writing can be quite an isolating endeavour. This approach allows you to explore ideas in a safe environment and often, one comment or observation from another participant can open up your mind to all sorts of possibilities. It also gives you the opportunity to road test the credibility of an idea from a global story perspective, and see how each individual story element fits in to the whole structure. An inspiring experience and highly recommended! Check out One Fine Morning for future workshop dates. 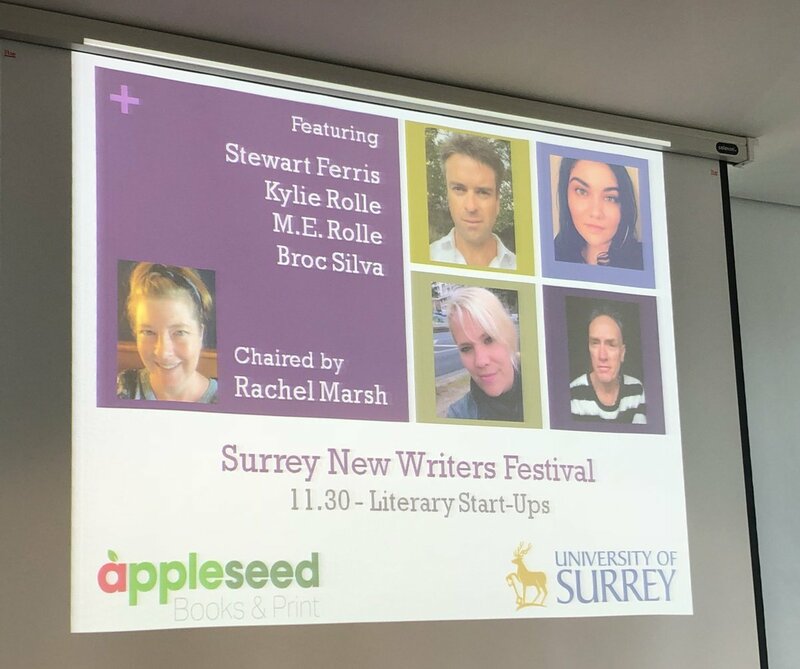 At the weekend, I joined a lively group of writers in Guildford at the Surrey New Writers Festival at G-Live, organised by the School of Literature and Languages at the University of Surrey. The mix of discussion panels and workshops made for some insightful debates, including; literary start-ups, creating and nurturing a support network, writing for TV and Film, a panel of agents, publishers and editors as well as a lunch time workshop delivered by writing coach and author, Melissa Addey. There was also a poetry stage going on throughout the day with readings from special guest poets. It was a great opportunity to network with local writers and chat with students and staff from the University, who invited me along to do a reading at the evening launch of the Stag Hill Literary Journal. 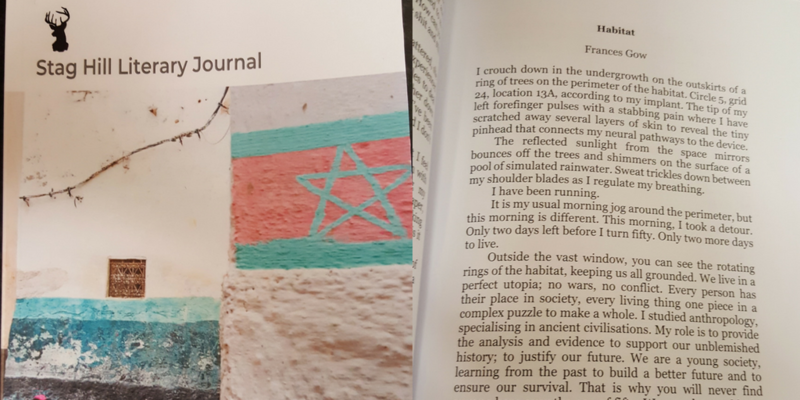 As a contributor to the inaugural issue, I was honoured to read an extract from my short story, Habitat, an near-future SciFi story, which appears in the journal. You can follow the future of the journal on their facebook page here, where you can get a copy of Issue One, read the online version or send in your own submissions. Thank you to M.E. Rolle and the editorial team for the opportunity to network and share my work with a wider audience. Of course, any job is a good job for a writer. We like to think we would be happy in isolation, chipping away at our work in progress, but actually any job that brings us into contact with people provides a rich source of inspiration and character ideas. Nevertheless, writers are wordsmiths and happiest when engaged in the written word, so here are twenty jobs for writers that make use of our skill. With the rise of content marketing, an increasing number of companies are paying freelancers to write articles for their blogs. 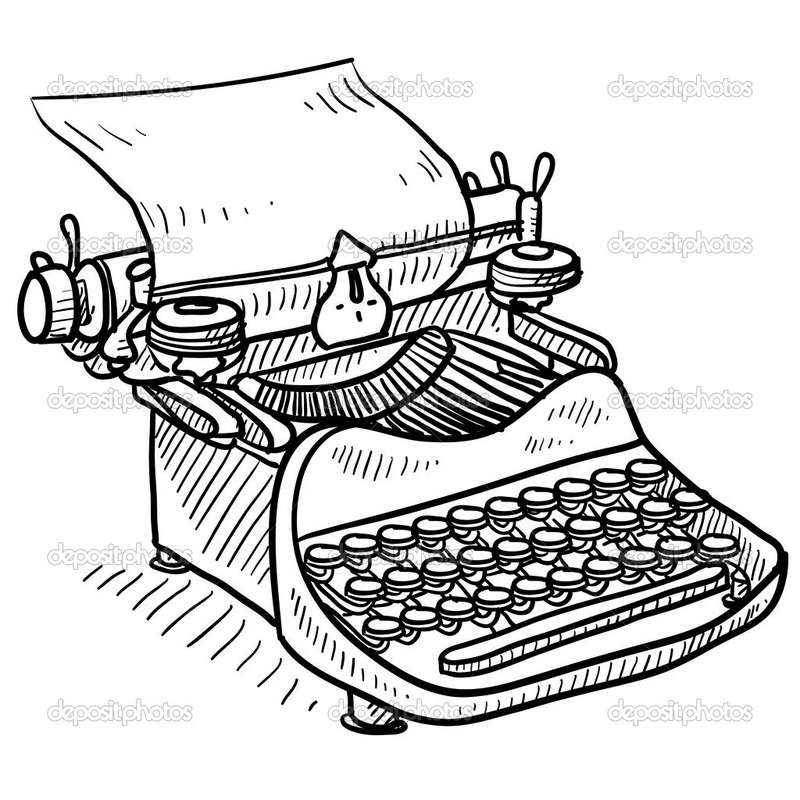 A combination of one-off articles or series of articles – useful to have a specialism. Be prepared to chase work. A reviewer writes an evaluation of the quality of something eg. books, films, food, art, music, theatre. Can be quite lucrative, often work as freelancers. This is a story about recycling. Recycling? I hear you say… sounds a bit boring. But bear with me. This is environmentalism explored on multiple levels. And… there are monsters lurking at the bottom of the garden. Sustainability is a dish best served with a touch of darkness. Enjoy. Available here from Cemetery Moon. My latest short story, At Goodge Street, is published today in STORGY Magazine; an online literary short story magazine which aims to ‘challenge literary conventions and experiment with genre, style, form and content’. What I like about STORGY is that it is an exploration of story across genres and media that at its heart examines what it means to be us… to be human. You’ll find art, culture, books, TV and film, competitions, interviews and more. 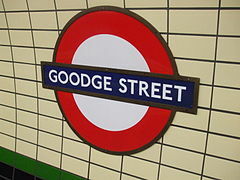 But before you explore the other delights STORGY has to offer, take a quick trip to Goodge Street, where you’ll find a weird adventure awaiting you. At Goodge Street follows the story of a couple who cross the boundary between fantasy and reality, playing a hidden game of love and betrayal against the backdrop of the myth and legend of ancient Hindu demons and gods. Thank you to the staff at STORGY for publishing my story and I hope you enjoy it! It has been a while since my last book, The King of Carentan, was published and I realise I have been quiet – various reasons for that; the length of time it takes to write a book, the length of time between writing a book and it being fit for public consumption and… new job notwithstanding… multiple other personal distractions. So I owe my readers a long overdue update on progress. Yes – you heard right, I am eight months into a new job which comes with its own challenges and priorities. But despite that, I have been busy on the writing front (check out my urban fantasy stories featuring Dryads in London). Book Three of the Carentan Series is due for release in June 2018 and will resolve some unanswered questions from Book One (no spoilers). If you are now scratching your head and wondering what or whom I am referring to, I have provided links below for you re-read the books and refresh your memory. Or if you are new to the series, the first two books will provide you with a good backdrop to Book Three – although not necessary to enjoy the book in its own right. Indeed, I have been most careful to ensure that each book is a stand-alone story – not dependent on reading the rest of the series. For you die-hard fans and those who badger me at opportune moments (I am not complaining as it keeps me on my toes!) – you may be pleased to hear that I am getting stuck in to another book in the Carentan Series. Completely independent of the first three books, but explores another character’s story in more detail. I’m saying no more. So, on that note, I leave you with some links where you can buy the books in the format of your choosing to update or if new to the series prepare for the release of the next instalment in 2018; The Prince and The Assassin. Comments, complaints, compliments and reviews (good, bad or indifferent), are always welcome and much appreciated. When I was a girl, my granda used to take me and my siblings for long walks in Ashridge Forest. We explored acres of glorious beech and oak woodlands, crunching through the bracken and collecting beechnuts and acorns to use as projectile weapons in the eternal sibling rivalry war. Trees have always fascinated me. The garden of my childhood was filled with hardy tree-climbing inspiration; Pines tall enough to see over the town and across the downs, Horse Chestnuts with perfect nooks and crannies for makeshift tree houses and stashing secret conker supplies. So, I guess it’s not surprising for me to link my love of trees and forests with my love of fantastic fiction. The Gone Gods is one in a series of stories that feature dryads, nymphs, wood elves and other magical creatures. Writers have handled dryads in different forms for many years. Such stories are as old as the gods themselves. We find dryads represented throughout literature; Paradise Lost by John Milton, The Virginians by William Thackeray, and particularly as symbols of nature in; On the Difficulty of Conjuring up a Dryad and On the Plethora of Dryads by Sylvia Plath. Dryads can also be found in fantastic fiction; The Chronicles of Narnia by C.S. 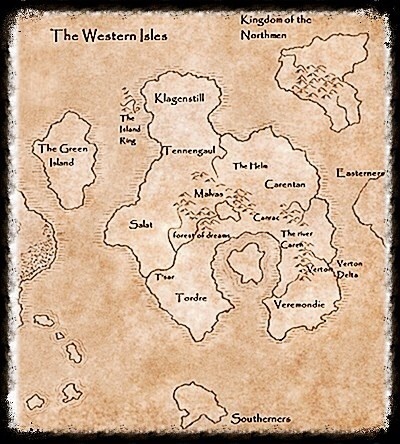 Lewis and The Belgariad by David Eddings. I am sure that you can come up with many more examples. This short novelette, The Gone Gods, is three chapters, which explore the juxtaposition between modern urban life and ancient myth; how these wonderful and alien creatures rub up against the modern Londoner. Hope you enjoy it. My story, Speak to Me, is published this month in New Realm. If you follow me on Pinterest, might have noticed my board for Dryads and Trees where I have been collecting pictures and researching dryads in literature to inform my latest obsession. According to Greek mythology, dryads are considered to be shy creatures, supernaturally long-lived and intrinsically linked to their trees. In the case of hamadryads, they are quite literally part of their tree and if the tree dies, so do they. Dryads are also known as wood or tree nymphs; ‘Nymph’ meaning ‘young woman’ in Greek, so they are always female. They never grow physically older, though they are very long-lived, wise and intelligent. They do not like being disturbed but will always be friendly if approached in the right way. Generally, they preside over groves of trees and forests. A dryad is born with a certain tree over which she watches and will punish mortals who harm trees. Animals and trees are friends of the dryads who are thought to be their protectors. This is a story about a dryad I found in a local park in East London. She too is quite shy, but harbours a deep desire to start conversations with people. Ironically, she has a curse hanging over her, which makes this particular yearning somewhat tricky.